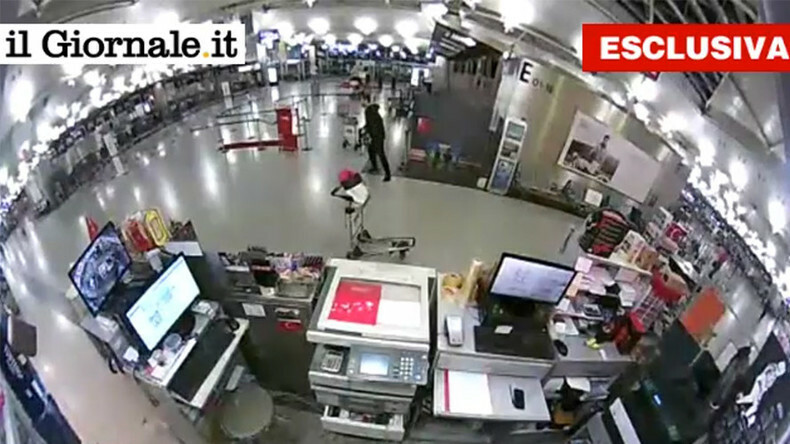 CCTV footage has caught one of the attackers at Istanbul Ataturk Airport smashing his rifle on the floor in frustration over being unable to find new victims. The footage released by Il Giornale newspaper shows dozens of people running away after hearing gunshots outside. The attacker, who was dressed in black and carrying a rifle, is seen entering the building, but finds the airport’s registration area completely empty. The man then appears to search the area for victims, but failing to find any, throws his gun on the floor in an apparent display of anger. Forty-four people were killed and over 230 injured in gun and bomb attacks on Europe’s third-busiest airport on Tuesday. Three suicide bombers first opened fire outside of the terminal to create panic before two of the attackers entered the building and blew themselves up, while the third detonated his explosive device at the entrance. Turkish police said the three suspected bombers at the airport were citizens of Russia, Uzbekistan and Kyrgyzstan with links to the Islamic State (IS, formerly ISIS/ISIL) terrorist group. The Russian national was reportedly a resident of Dagestan, a region in Russia's North Caucasus. Yeni Safak newspaper cited Turkish security services who identified the mastermind behind the attack as a Chechen named Ahmed Chatayev. Before joining Islamic State, he was one of the most wanted fugitives from various terror groups in the North Caucasus. Later on Thursday, a Russian security source told RIA Novosti that Chatayev had been wanted in Russia since 2008 over his links to terrorism. The source also dismissed Turkish media reports that a man named Osman Vadinov was one of the suicide bombers. "It's not a Chechen surname, and such a person never lived in Chechnya," he said. One of the organizers of the attack at Ataturk Airport, Chechen national Ahmed Chataev, was known to Bulgarian authorities for terrorist activities, Bulgarian BGNES news agency reported. Accoridng to the agency, Chataev was born in 1980 and has been wanted by authorities since 2008. There is evidence that he was hiding and lives in Western Europe. According to reports, he was part of a group loyal to Doku Umarov’s "Caucasus Emirate," and after Umarov’s death and the collapse of his group he joined Islamic State (IS, formerly ISIS/ISIL). Chataev was arrested by Bulgarian authorities, but in 2011 the appeals court did not allow his extradition to Russia. The suspect was able to travel to Europe and former Soviet states without any restrictions for 13 years, RIA Novosti cited a police source as saying.